September 20th 2018 marked exactly one year to go before the Rugby World Cup kicks off in Japan. To mark this event, the Japan Foundation and SOAS held a symposium on the topics of rugby in Japan and sporting mega-events themselves. 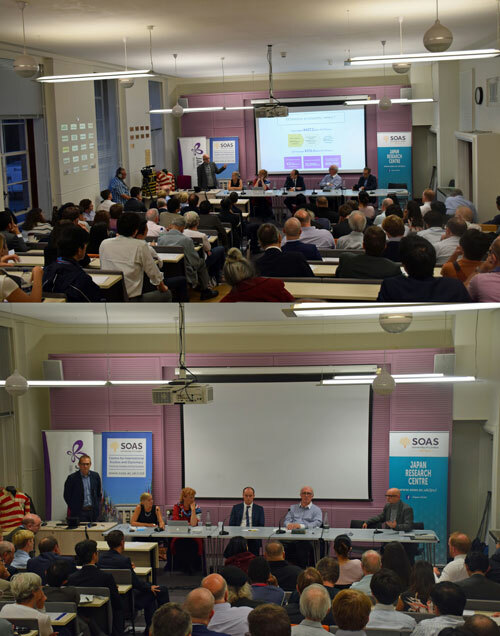 This event was the third in its series and the speakers presented to an excited full house at the SOAS Alumni Lecture Theatre. Our first speakers, offering a joint presentation on the history of rugby in Japan until the outbreak of World War Two, were Phil McGowan (World Rugby Museum) and Mike Galbraith (De Montford University). Their talks gave great insights into how rugby came to Japan and how it blossomed into a fully-fledged sport whilst showcasing their work into tracing Japanese rugby back to its earliest game. This was followed by Helen Macnaughtan's (SOAS) wonderful talk about how rugby flourished with the help of with the help of heavy industry companies following World War Two. Finally Bringing us right up to the present day and the current state of rugby in Japan and the national and local teams. The third speaker, Hilary Frank (Cornwall Council), gave us a series of personal insights into her work at the 1998 Nagano Winter Olympics, the 2002 Korea-Japan FIFA World Cup, and the 2019 Rugby World Cup. This personal approach gave the audience a chance to hear a side of the story that is rarely told. Our final speaker was Simon Chadwick (Salford University), who was able to show the economic side of these mega-events and offer a balanced and animated talk on the benefits and losses associated with hosting them. The talks were finished off with a Q&A session hosted by J. Simon Rofe (SOAS), with the audience providing some challenging questions for the speakers. Finally, to cap the evening off, there was a reception hosted by Sake Samurai, featuring two sommeliers on hand to offer tastings and give advice on sake. This gave the audience a chance to informally speak to the speakers and organisers, and to chat to each other about the evening. The Hakuho Foundation is now accepting applications for the 14th Hakuho Foundation Japanese Research Fellowship. With the goals of further strengthening the fundamentals of international research into Japan and deepening international understanding of Japan, the Hakuho Foundation Japanese Research Fellowship invites leading international researchers of the Japanese language, Japanese language education, Japanese literature and Japanese culture to Japan to conduct residential research. 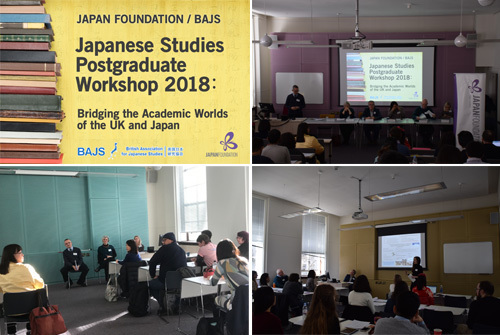 This February 16 2018 saw the return of the annual Japanese Studies postgraduate workshop, the seventh jointly hosted by the Japan Foundation London and the British Association for Japanese Studies (BAJS). Held at SOAS University of London and attended by 36 postgraduate students from 22 different UK universities working on Japan related research in diverse disciplines across the humanities and social sciences, the workshop was a great opportunity for these emerging researchers to receive practical advice on their research from senior academics, and to network with fellow postgraduate students. The year’s theme focused on how emerging academics in the UK can help to bridge the academic worlds of the UK and Japan through their research. Each of the 36 student participants were given the opportunity to make a five minute presentation on their Japan related research and why they believe it is important for the advancement of Japanese Studies in the UK and Japan in front of an audience of peers and senior academics. This was followed by lively group discussion sessions on how to make your research relevant to a wider audience in Japan and the UK. The afternoon saw a series of talks by leading figures from UK Japanese Studies taking on key challenges relating to conducting and disseminating research in Japan. Topics tackled included ‘Challenges of short fieldwork trips’ (BAJS president Dr Christopher Hood, University of Cardiff); ‘Ethical issues when doing fieldwork in Japan’ (Dr Erica Baffelli, University of Manchester); ‘Postdoctoral career development in Japan and the UK’ (Dr Peter Matanle, University of Sheffield); ‘Your role as a foreign researcher/academic in Japan’ (Prof Robert Aspinall, Doshisha University) and ‘Publishing in Japan’ (Dr Aya Homei, University of Manchester). The next session welcomed Prof Takehiko Kariya from the University of Oxford who provided a fascinating view from a Japanese scholar and sociologist on the different communities of Japanese Studies in the UK and the Social Sciences disciplines in Japan, and what emerging researchers in the UK can do to help bridge the gap between them. The workshop finished with a session on ‘Funding to continue your career in Japan and the UK’ with presentations from representatives of the Daiwa Anglo-Japanese Foundation, Embassy of Japan in the UK, Great Britain Sasakawa Foundation, Japan Society for the Promotion of Science, British Association for Japanese Studies and the Japan Foundation London introducing the wide range of potential sources of funding for Japanese Studies including funding to support research in Japan. Thank you very much to all participants and speakers for making the event such a great success. We hope to see you again at a future workshop! If you are a PhD student undertaking research on Japan and are interested in attending a similar event in future, please get in touch! The Hakuho Foundation is now accepting applications for the 13th Hakuho Foundation Japanese Research Fellowship. February 24 2017 saw the return of the annual Japanese Studies postgraduate workshop, the sixth the Japan Foundation has held in co-operation with the British Association for Japanese Studies (BAJS), and the second to be held outside London. This year’s workshop held at the University of Sheffield, was attended by 36 postgraduate students from 18 different universities in the UK and Europe working on Japan related research in diverse disciplines across the humanities and social sciences. The theme of this year’s workshop focused on how emerging academics can expand the impact of their research on wider academia and society outside the Japanese Studies community. The workshop opened with a series of inspiring case studies from senior academics at the University of Sheffield’s School of East Asian Studies. Prof Hugo Dobson, Dr Mark Pendleton and Dr Peter Matanle discussed their own experiences of conceiving, generating and recording the impact of their research covering diverse perspectives from international relations and ‘translating’ research for the media, working with policy-makers, to creative collaboration with visual artists. The presentations were followed by a series of hands-on workshop sessions led by Dr Thomas McAuley, Lecturer in Japanese Studies at the University of Sheffield, during which students worked in small groups to define their research for an audience of non-specialists, and to put together a statement on the potential impact and audience for their research. The workshop finished with a session on ‘Funding your Research’ with presentations from representatives of the Great Britain Sasakawa Foundation, Daiwa Anglo-Japanese Foundation, Japan Society for the Promotion of Science, British Association for Japanese Studies and the Japan Foundation introducing the wide range of funding programmes available to emerging researchers in Japanese Studies. Thank you very much to the British Association for Japanese Studies, the University of Sheffield and all participants and speakers for making the workshop such a great success. We hope to see you again next year! If you are a PhD student undertaking research on Japan and would like to attend a future workshop, please do get in touch! 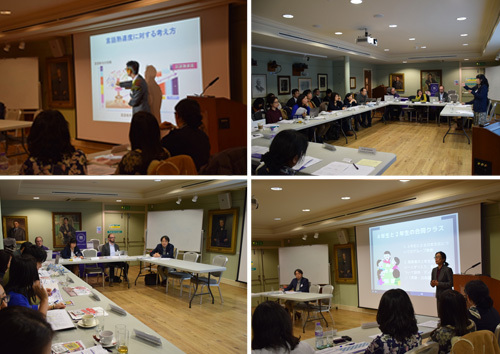 On Saturday 5th November the Japan Foundation London held the first Japan Year Abroad Programme (J-YAP) Coordinator Conference at the Royal Asiatic Society in London. As the inaugural meeting of the new J-YAP Coordinators Network, the conference was the first opportunity for staff members involved in the administration of Year Abroad Programmes within Japanese/Japanese Studies degree courses at universities across the UK to gather to share information on how to combat common administration challenges and help enable students make the most of their unique Year Abroad programme opportunities. Participating in the discussions were 14 Year Abroad Programme Coordinators and related staff members from 11 universities which offer Japanese/Japanese studies degree courses, and members of the British Association for Japanese Studies and other key Japanese Studies related organisations. The conference was divided into three themed sections led mainly by current Year Abroad Programme Coordinators. The first session opened with a lively discussion on ways to utilise returning 4th year students as resources to deliver student guidance and support before and during the Year Abroad and therefore lighten the workload of J-YAP administrators, focusing on two case studies of innovative strategies put in place by UK universities. Session 2 addressed challenges experienced by universities when sending students with diverse needs to Japan, such as negotiation with Japanese partner universities and student placement. Current Year Abroad Programme coordinators introduced their own experiences and led a discussion during which participants shared and developed practical and collaborative strategies to deal with these challenges. During this session, The Japan Foundation’s own Chief Language Advisor Makoto Netsu also introduced the JF Standard (Japanese site/English pamphlet) as an objective measure which can be used to standardise the evaluation of student’s Japanese language proficiency before and after the Year Abroad so that students can continue their language study in Japan building on their previous achievements at their home university. The third and final session examined ways to help students make the most of the unique opportunities during the Year Abroad to help prepare for further studies on return to the UK and their future career beyond graduation. Dr Chris Perkins (British Association for Japanese Studies) explored how to integrate preparations for the fourth year dissertation not only into the Year Abroad itself, but also into the full four year degree programme as a whole. Ms Kiko Hill (Disco International Ltd.) introduced ways that students can use their time during the Year Abroad to prepare themselves for careers in Japan or Japanese companies. Thank you to all participants and speakers for making the J-YAP Coordinator Conference such a great success and we look forward to future J-YAP network activities! The Hakuho Foundation is now accepting applications for the 12th Hakuho Foundation Japanese Research Fellowship. Natsume Soseki Japanese Essay Competition: Call for entries! To mark the 100th anniversary of the death of Natsume Soseki (1867-1916), the Asahi Shimbun Co., in co-operation with the Japan Foundation, Iwanami Shoten Publishers and Ferris University, is inviting entries for an international essay contest on the continuing appeal of the influential Japanese author’s works among foreigners. Soseki, one of Japan's most famed and popular authors, lived in Japan’s period of transition to a modern society. His works have been extensively translated overseas and his representative work, “Kokoro” (Heart), has been translated into more than 20 languages. Content of Essay: Participants are required to write essays in Japanese about Soseki’s appeal, which remains strong even today. The theme of the competition is “Soseki and I”, and essays submitted should include the circumstances about when the participant read Soseki’s work for the first time (title of the work, when, where, in what language and why). Essays must be 2,000 Japanese characters or less. Eligibility: Entries for the essay competition will be accepted from those living overseas or in Japan whose native language is not Japanese. For those residing in Japan, their stay in the country must be less than two years. International students studying in Japan are also eligible to participate. Prizes: Three winners (including one first prize winner, and two runners up) will be invited to attend a symposium on Natsume Soseki which will be held at the Yurakucho Asahi Hall in Tokyo on 10th December 2016. Deadline for entries : Applications are now open and will close on 10 August 2016. 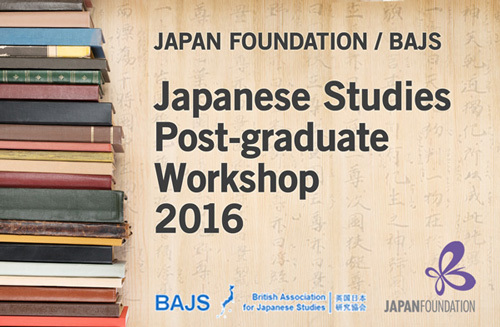 February 4th 2016 saw the return of our annual Post-Graduate Workshop, the fifth organised by the Japan Foundation in collaboration with the British Association for Japanese Studies (BAJS). 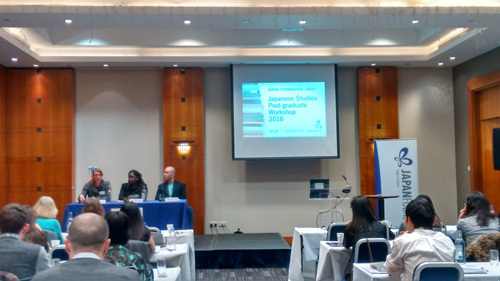 This year’s workshop, hosted at the Holiday Inn Bloomsbury in London, was attended by a full house of 40 postgraduate students in Japan related fields representing a record number of 22 universities across the UK. The workshop was a great opportunity for these emerging researchers to receive practical advice on their research from senior academics, and to network with fellow postgraduate students. During the day four PhD students presented their research and received constructive comments and questions from fellow-postgraduate students and senior academics in discussion sessions chaired by BAJS President Professor Caroline Rose. The four presentations were chosen from a number of excellent and diverse proposals, and covered topics ranging from disaster mental health in Japan (Ben Epstein, UCL), technology and Japan in the British press (Christopher Hayes, Cardiff University), ‘Expressive’ women and Western attire in Japanese cinema (Lois Barnett, SOAS, University of London), and child guidance centres in Japan (Michael King, University of Oxford). The workshop also featured several practical sessions by BAJS committee members and senior academics who provided practical advice on real problems affecting emerging Japanese studies researchers. Dr Susan Townsend (University of Nottingham) gave some excellent advice on carving academic and career opportunities outside ‘East Asian studies’ departments, drawing from her own experience as a Japan specialist working in the Department of History at the University of Nottingham. Later in the afternoon, to tackle some of the challenges faced by students using Japanese language in their research careers, Dr Thomas McAuley (University of Sheffield) and Dr Luli van der Does-Ishikawa teamed up to lead a very enjoyable and practical session which explored how to use social media to promote your research and raise your profile in Japanese academia using Japanese language. Responding to feedback received during last year’s event which identified securing postdoctoral positions as a key challenge for emerging researchers, this year’s workshop introduced a panel session featuring three early career researchers and lecturers in Japanese studies who were able to offer career advice from recent experience. Dr Jonathan Service (University of Oxford), Dr Gitte Marianne Hansen (Newcastle University) and Dr Ruselle Meade (Cardiff University) each introduced their individual career paths, and then took questions from the audience in an interactive panel discussion. Dr Hansen and Dr Meade had participated in our very first post-graduate workshop as PhD students in 2012, and it was inspiring to have them participate four years later as established lecturers! The workshop finished with a session on ‘Funding your Research’ with presentations from Susan Meehan (Daiwa Anglo-Japanese Foundation), Chigusa Ogaya (Japan Society for the Promotion of Science), Rory Steele (Great Britain Sasakawa Foundation), and Julie Anne Robb (Japan Foundation) introducing the wide range of funding programmes available to researchers in Japanese Studies. The event was followed by a networking dinner reception, generously funded by BAJS. Thank you to all participants and speakers for making the workshop such a great success. We hope to see you again next year! The Japan Foundation is now accepting proposals for projects to receive Grants for Intellectual Exchange Conferences for the 2016-2017 fiscal year. This grant provides support to non-profit making organisations (eg. institutions of higher education, research centres, think tanks, NGOs, cultural organisations etc.) wishing to carry out collaborative intellectual projects, such as international conferences, seminars and workshops, that address common challenges faced by Japan and other nations, or contribute to facilitating a greater understanding of Japan overseas. To apply for the programme, please read the information on the Japanese Studies page carefully and contact Julie Anne Robb at the Japan Foundation to discuss eligibility. Projects should be implemented and completed between April 1st 2016 and March 31st 2017. The deadline for applications is Friday, 1 December 2015. The application forms for the Japanese Studies Fellowship Programme 2016 have now been released on our Tokyo website here. This programme provides opportunities to outstanding scholars in Japanese Studies who wish to conduct research in Japan. It is split into three categories: Long-Term Scholars and Researchers, Short-Term Scholars and Researchers, and Doctoral Candidates. To learn more about the programme contact Julie Anne Robb or visit the programme list on our Tokyo site. Please discuss your eligibility with the Japan Foundation before applying. The Japan Foundation Japanese Studies Student Survey is part of the Japan Foundation’s periodic assessment of the state of Japanese Studies in the UK which has been conducted once every 3-4 years since 1996. The Japan Foundation is Japan’s principal organisation for promoting international cultural exchange worldwide and through our funding programmes we offer support to organisations and individuals working in the field of Japanese Studies throughout the UK. In order for us to consider future plans for the enhancement of Japanese studies, we are eager to learn the views of Japanese Studies students in the UK, both at undergraduate and postgraduate level, so that we can continue to support you and the field of Japanese Studies as effectively as possible. Please note that the deadline for completing the survey has been extended to 30th September 2015. Any students undertaking Japan-related study at a higher education institution in the UK. Whether you are at undergraduate level or postgraduate, undertaking a single or joint honours Japanese Studies degree, or simply taking a module in a Japan related subject, we would be delighted to hear from you. We estimate that the entire survey can be completed in around 15 minutes. Please fill out the survey before 30th September 2015. The results of the survey will be published in late 2015, and individual answers will remain anonymous. You can find the results of the Japanese Studies Students Survey 2010 on the Japan Foundation Japanese Studies Survey website here. If you choose to provide us with your name and e-mail address, you will be entered into a prize draw, for a chance to win one of up to 10 Japan-related book tokens worth £20 each. As a new financial year begins, funding (up to £1,500) is once again available in the area of Japanese Studies/Intellectual Exchange for projects that help to promote a greater awareness of Japan, as well as travel grants (up to £600) for applicants who are planning to visit Japan for research. :: Click here for more information about the Local Project Support Programme and Study Support Programme. Japan Foundation / Links Japan Corporate Social Responsibility Seminar Series V <br> What is the difference between social enterprise, social impact business and socially responsibly business? Japan Foundation World Heritage Picture Panels On Offer!! Click here for old issues of the Japan Foundation London newsletter, Perspectives.